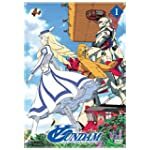 Nozomi Entertainment (Right Stuf) brought us a DVD edition of Turn A Gundam not long ago. They're now upping the ante with a Blu-ray Disc edition out sometime next year. I've seen relatively little Gundam — the original series, some of Wing, the first season of SEED — so I'm by no means an expert, but Turn A is thus far my favorite of the bunch, and the one most likely to lend itself to some discussion here. Expect that when the BD drops. Update: The good news just got even better. Right Stuff will be providing an exchange/upgrade program for those who bought the DVD editions. A while back word dropped that superhero homage/parody Tiger & Bunny was to be adapted into a live-action feature film on this side of the Pacific, something I thought was a splendid idea. Now a writer has been officially attached, Ellen Shanman, a voice actress who did some work on Pokémon but also has some pending feature film and some other existing TV credits to her name. Street date: 2019. Breath held. One of the titles that dropped between the cracks when Bandai shuttered its U.S. wing was Sword of the Stranger, an immensely impressive samurai/martial-arts feature film that came out back in 2007. Add that one to the growing roster of titles picked up by Funimation, out November 8. The company will also be releasing Hideaki Anno's new take on Godzilla, which has been trailed by superlative word. You sure it's a wise idea to pair up a (most likely bogus) wealth-enhancement ad with an image of a fellow cosplaying a character best known for being perpetually broke? Mr. Gintoki, call your office.